General manager John Lynch expects Pettis to bulk up during the offseason, Joe Fann of the 49ers' official website reports. "We loved the way [Pettis] closed this season," Lynch said. "There's some maturation that I think is naturally going to come in terms of putting some girth on and some strength. I think this offseason is very important for him." Pettis (knee) was placed on injured reserve Saturday. 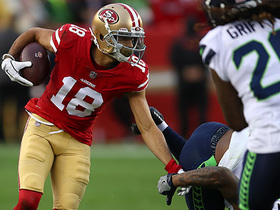 Analysis: The move means little for the status of Pettis' sprained MCL -- he was already ruled out for Week 17 on Monday -- as the 49ers are just clearing roster space for healthy players prior to the season finale. The rookie second-round pick caught 27 passes for 467 yards and five touchdowns in 12 games, coming on strong towards the end of the season. Kendrick Bourne and Trent Taylor are likely to start at wide receiver Sunday against the Rams, with Marquise Goodwin (calf) also sidelined. Head coach Kyle Shanahan has ruled Pettis (knee) out for the season finale Sunday against the Rams, Nick Wagoner of ESPN.com reports. Analysis: Pettis sprained his MCL during this past weekend's loss to Chicago. His season now over, the 2018 second-rounder will get an early start to the offseason with much to build upon after averaging four receptions for 71.8 yards with four touchdowns over the final five games of the season. The impending return of Jimmy Garoppolo (knee) at quarterback in 2019 makes Pettis' future even brighter. Pettis sustained an MCL injury Sunday against the Bears and is not expected to need surgery, Matt Maiocco of NBC Sports Bay Area reports. Analysis: It seems unlikely Pettis will play in the 49ers' meaningless Week 17 contest, but it's at least positive news that the rookie is not expected to need surgery. Kendrick Bourne figures to benefit the most in the event Pettis is indeed ruled out next week. Pettis (knee) won't return to Sunday's contest against the Bears. Analysis: The severity of Pettis' knee concern isn't known, but the 49ers won't risk his health with little to play for, draft positioning aside. Marquise Goodwin and Kendrick Bourne should benefit the most in Pettis' absence, but Trent Taylor and even Richie James are on hand for his vacated targets. Pettis is questionable to return to Sunday's contest against the Bears due to a knee injury, Eric Branch of the San Francisco Chronicle reports. Analysis: Pettis dealt with a knee injury late in the preseason and for most of the first half of the regular season, but he's mostly been injury-free since the calendar flipped to November, aside from a foot issue that limited him a bit during Week 15 prep. If he doesn't reenter the game, he'll fall short of 49 receiving yards for the first time since Week 10. Look for Marquise Goodwin and Kendrick Bourne to profit in Pettis' absence. Pettis corralled all five of his targets, racking up 83 receiving yards during Sunday's 26-23 win against Seattle. Pettis (foot) is active for Sunday's game against the Seahawks. Analysis: As expected, Pettis will be available in spite of logging limited practices Thursday and Friday. 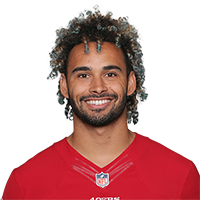 In three appearances since the 49ers' Week 11 bye, he's racked up 12 receptions (on 21 targets) for 255 yards and four touchdowns, including a 5-129-2 line Week 13 in Seattle. Pettis (foot), who is listed as questionable for Sunday's game against the Seahawks, is in line to play, a source told Adam Schefter of ESPN. Pettis (foot) is listed as questionable for Sunday's game against the Seahawks, Matt Maiocco of NBC Sports Bay Area reports. Analysis: Pettis and Marquise Goodwin (calf) were both mid-week additions to the injury report, logging limited practices Thursday and Friday after full sessions Wednesday. While there's been no report of either injury being serious, the situation may need to be monitored leading up to Sunday's 4:05 PM ET kickoff. Kendrick Bourne, Trent Taylor and Richie James are the healthy wide receivers on the 49ers' roster. Pettis was listed as a limited participant at Thursday's practice due to a foot injury, Cam Inman of The San Jose Mercury News reports. 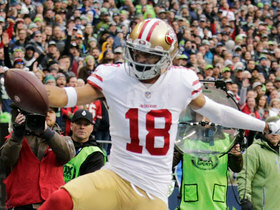 Pettis brought in three of seven targets for 49 yards and a touchdown in the 49ers' 20-14 win over the Broncos on Sunday. Analysis: Pettis remained in the starting lineup despite the return of Marquise Goodwin (personal), and he rewarded fantasy owners with his fourth touchdown over the last three games. The 23-year-old has seen seven targets in each of those contests, and he's consistently displayed a strong rapport with rookie signal caller Nick Mullens. Pettis figures to remain with the first unit against the Seahawks in Week 15. 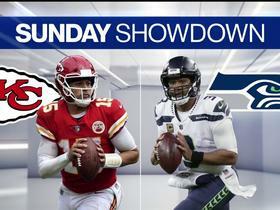 Pettis is expected to remain in the starting lineup Sunday against the Broncos with fellow wideout Pierre Garcon (knee) ruled out for the contest, Nick Wagoner of ESPN.com reports. Pettis caught five of seven passing attempts for 129 yards and two touchdowns in Sunday's 43-16 loss to the Seahawks. He also lost two yards on his lone carry. Pettis will retain a spot in the starting lineup Sunday against the Seahawks with Marquise Goodwin (not-injury related) and Pierre Garcon (knee) ruled out for the contest, Matt Maiocco of NBC Sports Bay Area reports. 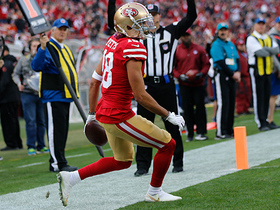 Pettis brought in four of seven targets for 77 yards and a touchdown in the 49ers' 27-9 loss to the Buccaneers on Sunday. Pettis had four catches (six targets) for 12 yards in Monday's 27-23 loss to the Giants. Pettis was not targeted in Thursday's win over Oakland. His only action came on a punt return that went for no gain. Analysis: Trent Taylor was a healthy scratch, but the slot man's absence was filled by a combination of Kendrick Bourne and Richie James. Pettis dealt with a knee injury earlier this season, but he has yet to record a catch in two games since returning to action. The 23-year-old doesn't appear to be in the 49ers' immediate plans, despite his status as a second-round draft pick. Pettis (knee) failed to haul in his lone target in Sunday's 18-15 loss to the Cardinals. Pettis (knee) was a full practice participant Friday and doesn't have an injury designation for Sunday's game at Arizona, Darren Urban of the Cardinals' official site reports. Analysis: The rookie's return comes at a convenient time with fellow wideout Pierre Garcon (knee/shoulder) listed as doubtful. Kendrick Bourne is also a candidate to take on some of Garcon's snaps, but it won't come as much of a surprise if Pettis has a key role in the offense for his first appearance since Week 4. Pettis (knee) was a limited practice participant Wednesday, Eric Branch of the San Francisco Chronicle reports. Analysis: After missing the last three games due to the left knee injury, Pettis appears to be getting healthier. As evidence, he went through individual drills Wednesday without any sort of support on the knee, per Jennifer Lee Chan of NBC Sports Bay Area. 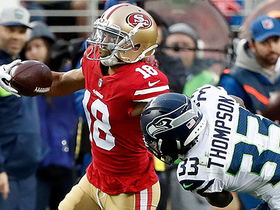 If he gets through the week without a setback, Pettis will bolster a 49ers receiving corps that likely will be without Pierre Garcon (knee) in Sunday's game at Arizona. Pettis (knee) has been ruled out for Sunday's game against the Rams, Cam Inman of The San Jose Mercury News reports. Analysis: Pettis returned to practice Wednesday as a limited participant but was then held out of Thursday's session. He'll sit out for a third straight game, perhaps targeting a return Week 8 in Arizona. Pettis (knee) was held out of practice Thursday, Nick Wagoner of ESPN.com reports. Analysis: Pettis dabbled with practice Wednesday for the first time since hurting his left knee Week 4, but the experiment seemingly didn't go as planned. He was ruled out on the 49ers' final injury report before both of the previous two games, forecasting coach Kyle Shanahan's potential thought process with the rookie wide receiver. Pettis (knee) returned to practice Wednesday as a limited participant, Matt Barrows of The Athletic reports. Analysis: This is the rookie's first practice in any capacity since he injured his knee in a Week 4 loss to the Chargers. It'll be difficult to have confidence in Pettis suiting up for Sunday's game against the Rams unless he returns to full participation by the end of the week. He'll likely serve as the Niners' No. 4 wideout whenever he's available to play. Pettis (knee) has been ruled out for Week 6, Matt Barrows of The Athletic reports. Analysis: Pettis will miss his second straight game with a knee injury suffered against the Chargers on Sept. 30. With Marquise Goodwin (hamstring/quadriceps) banged up as well, the 49ers could be short on receiving options entering Monday's game. For what it is worth, Trent Taylor and Kendrick Bourne saw significant passing game work without Pettis or Goodwin on the field, combining for 11 catches on 15 targets Sunday against the Cardinals. Coach Kyle Shanahan ruled Pettis (knee) out for the 49ers' Week 5 contest against the Cardinals, Joe Fann of the team's official site reports. Analysis: Pettis departed Sunday's defeat to the Chargers in the first half and didn't return. After undergoing an MRI on Monday, he isn't a candidate to play Week 5, per Shanahan, indicating a significant knee injury. It remains to be seen if Pettis will miss time beyond this weekend, but Kendrick Bourne seemingly will benefit with fellow wide receiver Marquise Goodwin (thigh, hamstring) also tending to injuries. The 49ers believe Pettis (knee) avoided a long-term injury, but he's nonetheless scheduled for an MRI on Monday, Matt Maiocco of NBC Sports Bay Area reports. Analysis: Pettis was unable to return to Sunday's 29-27 loss to the Chargers after injuring his left knee on a punt return in the first quarter. He was replaced by Trent Taylor on special teams, with Kendrick Bourne stepping up to post a 3-34-1 receiving line as the No. 4 wide receiver. The initial optimism suggests Pettis avoided a major ligament injury, but the 49ers won't know for sure until they see results from the MRI. Pettis (knee) won't return to Sunday's contest against the Chargers, Cam Inman of The San Jose Mercury News reports. 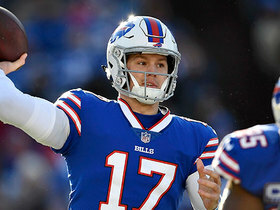 Analysis: After his first-half visit to the locker room, Pettis was seen riding a stationary bike on the sideline but eventually ruled out at the start of the third quarter. He was blanked for the second consecutive game Sunday, leaving him with three catches (on seven targets) for 96 yards and one touchdown on the season. Until his knee injury has a specific diagnosis, there's no telling how long he may be sidelined, if at all. Pettis is questionable to return to Sunday's game against the Chargers due to a knee injury, Matt Maiocco of NBC Sports Bay Area reports. Analysis: Injured on a punt return in the first quarter, Pettis required assistance to get to the sideline and eventually rode a cart to the locker room, per Matt Barrows of The Athletic. Pettis has been hit or miss as a rookie, averaging 32 yards and scoring one touchdown on his three receptions. As long as he's in recovery mode, Kendrick Bourne should benefit among the fringes of the 49ers receiving corps. Pettis did not receive a target in Sunday's loss to the Chiefs. Analysis: Pettis received his first NFL start last week in place of Marquise Goodwin, but he reverted to a depth role after the injured wideout returned to the lineup Sunday. The second-round pick flashed his big-play upside with 96 yards and a touchdown on just three receptions in place of Goodwin over the last two weeks, but it appears that only an injury to one of the 49ers' starting wideouts would open a path to significant snaps moving forward. Pettis' teammate Marquise Goodwin (quad) is listed as questionable for Sunday's game in Kansas City, Matt Maiocco of NBC Sports Bay Area reports. Analysis: Pettis replaced Goodwin in the starting lineup for last week's 30-27 win over Detroit, catching one of two targets for 35 yards while playing 88 percent of the snaps on offense. The rookie second-round pick should get a few more chances if Goodwin misses another contest, as the Chiefs likely will force Jimmy Garoppolo to throw far more passes than he did last week (26). Goodwin is expected to come down to a game-time decision after logging limited practices throughout the week. Pettis took his lone reception (two targets) for 35 yards in Sunday's victory over the Lions. Coach Kyle Shanahan said Pettis will replace Marquise Goodwin (quad) as a starter Sunday against the Lions, Nick Wagoner of ESPN.com reports. Pettis caught two passes (five targets) for 61 yards and a touchdown in Sunday's loss to the Vikings. Pettis (knee) wasn't listed Wednesday on the 49ers' Week 1 injury report. Analysis: Pettis missed the exhibition finale due to a bruised knee but seems to be fully healthy in advance of the first regular-season game of his career. Selected in the second round of this year's draft, he'll seek to supplant Trent Taylor for reps out of the slot as the campaign wears on. Head coach Kyle Shanahan said Pettis is nursing a bruised knee and won't be available for the 49ers' preseason finale Thursday against the Chargers, Nick Wagoner of ESPN reports. Analysis: Pettis is a lock to make the roster anyway considering the 49ers made him a second-round pick in this year's draft. Furthermore, Shanahan said there's a chance the rookie could be available for Week 1, suggesting that Pettis isn't dealing with a long-term injury. Pettis caught one of four targets for 53 yards during Thursday's preseason opener against the Cowboys. Analysis: Pettis didn't make much of an impact in the first half aside from drawing a pass interference call, but he stood out while making a big third-quarter grab that helped set up a field-goal opportunity. The 2018 second-round pick has drawn positive reviews throughout training camp and flashed his ability in his first taste of NFL game action. If Pettis can build a strong rapport with starter Jimmy Garoppolo, he could carve out some fantasy value in his rookie season. Pettis has gotten off to a strong start in camp, receiving several positive reviews from 49ers starting quarterback Jimmy Garoppolo, Matt Maiocco of NBC Sports Bay Area reports. Pettis signed a four-year contract with the 49ers on Wednesday. Analysis: The 44th overall selection in April's draft was the 49ers' final pick to ink a deal, just in the nick of time with training camp beginning Thursday. The Washington product could see a fair amount of run to begin camp, especially in the slot since Trent Taylor (back) was placed on the Physically Unable to Perform list. 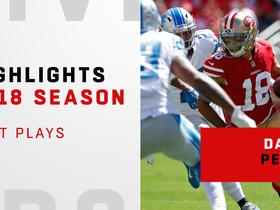 Watch the best plays from San Francisco 49ers wide receiver Dante Pettis' rookie year in the 2018 season. San Francisco 49ers wide receiver Dante Pettis gives a big stiff arm as he makes a 15-yard catch against the Seattle Seahawks. San Francisco 49ers quarterback Nick Mullens drops a dime pass for wide receiver Dante Pettis for a big 30-yard gain. 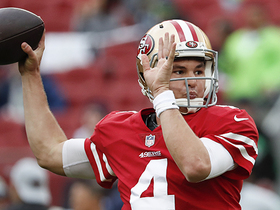 San Francisco quarterback Nick Mullens puts on some move to get a 26-yard pass to wide receiver Dante Pettis against the Seattle Seahawks. 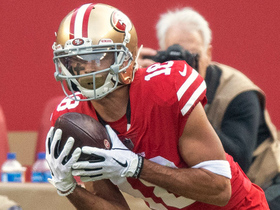 San Francisco 49ers wide receiver Dante Pettis picks up 31 yards on a crucial third down on a pass from his quarterback Nick Mullens. 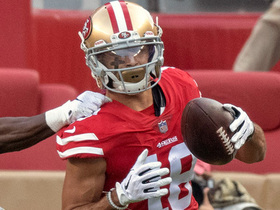 San Francisco 49ers wide receiver Dante Pettis pulls in a 17-yard grab on a pass from his quarterback Nick Mullens.